All in all, it appears there is a definite need for a more efficient and much less costly means of getting into orbit, and for more efficient ways of reaching other planets or changing orbits—methods that do not require huge amounts of propellant or take incredibly long periods of time to get up to speed and reach a destination. 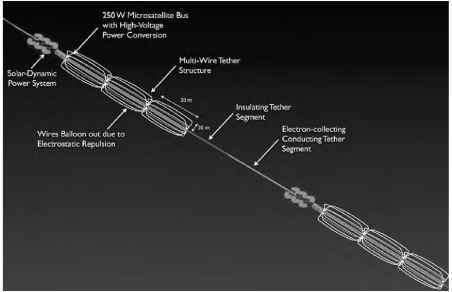 Several tether applications do enable quick spacecraft accelerations, by electrodynamically propelling or even throwing satellites into higher orbits. Many space tether concepts are also fully reusable, in contrast to conventional launchers that leave a lot of waste, such as spent rocket stages falling back to Earth (sometimes with leftover toxic propellant on board) or remaining in orbit as space debris. Moreover, rockets expel gases and small particles into the atmosphere. With the current low launch rate, the effect on the environment is negligible, but if we require more frequent access to space in the future, then pollution may become an important issue. Tethers enable more sustainable spaceflight than our current propulsion technology (the United Nations defines "sustainable" as "development that meets the needs of the present without compromising the ability of future generations to meet their own needs''). The space elevator concept has the potential to cause a revolution in human history. We have been living at the bottom of a gravity well up until now, and we only recently acquired the technology to climb out once in a while at high cost. A space elevator would provide an easy, regular, and sustainable way out of that well, allowing many people to clamber up and explore, develop, and colonize space ever further. As will be shown in the next chapters, tether technology is a possible solution for many of the most stringent spaceflight constraints.